Oil of oregano is one of the most widely respected and commonly used herbal remedies. Just ask any crunchy mama about her go-to cure-all for colds, flus and everyday infections, and I’m willing to bet that 9 out of 10 will include this traditional medicine. And luckily (and because I’m me, and I think it matters), science agrees! Oil of oregano has been laboratory tested again and again, and has proven itself as a powerful antibacterial and antifungal agent. Oil of oregano has successfully been shown to fight everything from candida yeast to protozoan parasites. So seriously, this isn’t just another “woo-woo” hippie fix. Oil of oregano is totally legit. The only rub? This stuff’s expensive! Like, almost 15 bucks for an ounce that’s wild-crafted, and upwards of $30 for a bottle that’s certified organic! Too rich for your blood? Yeah, me too. So how about you just make it yourself for roughly 25 cents per ounce. Here’s how . . . 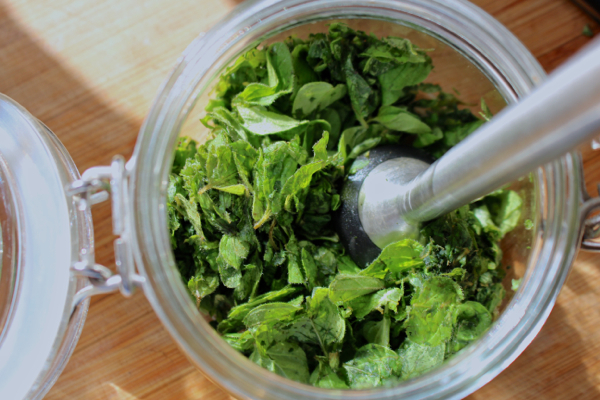 Carefully wash the oregano with water, and pat it dry. 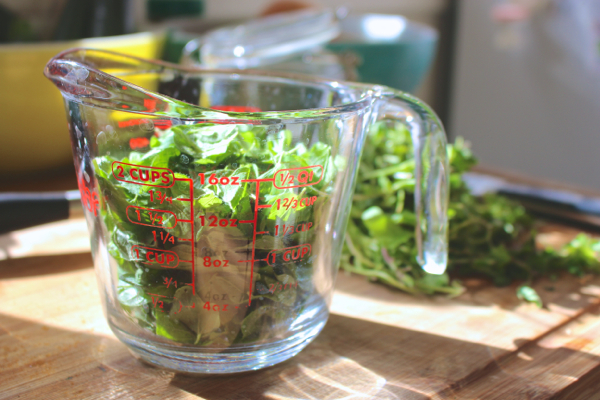 Pluck the leaves from the stems (save the stems for your homemade veggie stock!) until you have about 2 cups worth of leaves. Transfer about a 1/2 cup of the oregano leaves to the glass container. Use the muddler to mush them around the bottom of the glass. You want to get them good and smooshed so the cell walls burst and they release their oils. They’ll shrink down a lot, and quickly. 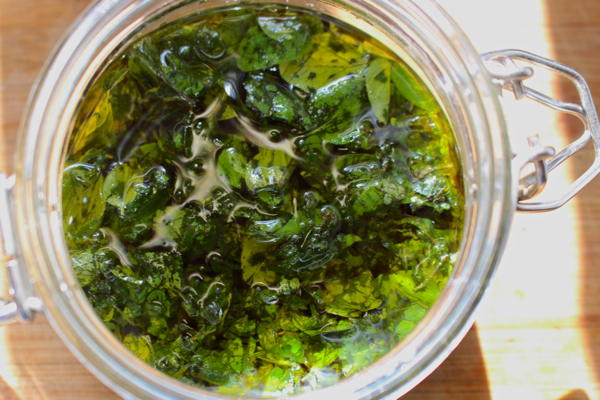 Add the rest of the leaves about a 1/2 cup at a time, until all 2 cups have been muddled. I love the light in these photos – it’s harsh, and it’s very yellow. That’s the light of autumn! Now, pour the oil over the leaves and use the muddler to stir everything around a bit. It’s best if the oil is a little warm, which you can accomplish by using either a microwave or by letting the oil sit in a pot of hot water. Either way, it will help the infusion if the oil’s warm. So add the organic olive oil and give it a stir. Replace the lid. Now you wait. The oil will need to infuse for at least a week, but ideally two. Keep it in a cool place away from direct sunlight, and give it a little shakey swirl every few days. It will darken to a rich brown color. When it’s finished infusing, strain the oil using cheesecloth or a nut milk bag. 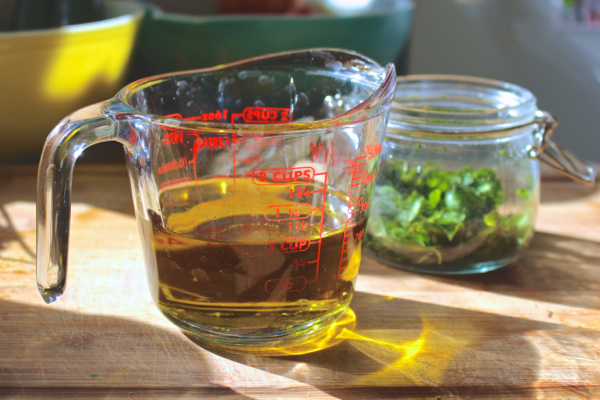 Store the oil in a glass jar with a tight fitting lid, in the refrigerator, and administer as needed. I’ll be using this all-natural antimicrobial powerhouse to keep our immune systems going strong all winter. Watch out, germy germs! Well dangit grad school brain! I suppose I should include some actual instructions for use, eh? So for myself, I usually take it orally, 3-5 drops in water once a day. I do this if I’m feeling run down or feel a cold coming on. In this way, I use it prophylactically. Of course I’ll also do this if I already have the cold, to help speed my recovery. Oil of oregano is anti-inflammatory and is full of antioxidants, so it offers wonderful immune support. Some people take it regularly whether they’re feeling down or not. I tend not to like doing this with herbal infusions/essential oils, because I believe they are strong medicine and should be reserved for actual medicinal use. But your mileage may vary. Many people take capsules regularly to help with intestinal distress and to ward off internal parasites. Oil of oregano can also be used topically as an antimicrobial agent. Mix a few drops with a teaspoon of olive oil or coconut oil and apply to a cut, or to help heal a fungal infection. This can also be applied to the gums in cases of oral distress. And finally, you can make a DIY hand sanitizer by mixing 10 drops of the oil with 2 tablespoon of coconut oil (or 20 drops in a 1/4 cup for a larger batch). Rub this on your hands throughout the day, to keep the germs away. Hope that helps! 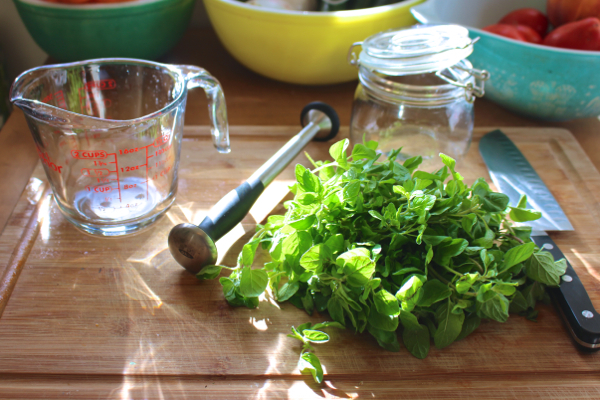 And please let us know – how do YOU use oil of oregano? I like to boil a bit of dried oregano into a decoction, strain, and flavor it with ginger and sweeten during winter. I drink a big cup every day, it’s not my favorite drink, but it really does help! How do you use it? Only as treatment or to prevent as well? What dosage? I need to ask my mom (a herbalist) about this as well. I am curious how to use it as well. Do you ingest it or put it on your skin? (Or both?) If used topically, where on the body do you put it? I’m so excited to make this! How often and how much do you take in? Only when you’re feeling crappy or more often? I normally go nuts with miso soup or kuzu and umeboshi plum when I’m feeling sick and I love learning about new remedies. Thanks! great! Thanks for the recipe! I’ll totall ymake this :-) I also would like some advice on how to use it. Thanks so much! Ooh I’m growing a bunch of oregano in my potted garden – I’ll definitely try this. Thanks for the tip Toni! Sorry Gaby, I amended the post above to include instructions for use! Hey Emily, so I added some info on ways to use the oil, at the bottom of the post. Sorry about that! Hey Sonja – whoops, I added suggestions for using the oil to the bottom of the post. Sorry about that! Love the herbal remedy!! Just thought I’d add that I’ve always been told not to keep infused oils made with fresh plant material around for internal use for longer than 3-5 days. You may want to look into that, but I do love the recipe! Hi Christine – it’s not something I worry about, but you can store the oil in the fridge if you’re concerned. In fact, I’ll add that to the post as well! Leave it to you Sayward to come swooping in as my night in shining armor! I’ve been wondering about making this stuff myself to ward off the grad school buggies that are floating around. Thanks to you I’ll be making a batch this weekend! Nice job! I have a mess of oregano in the backyard that will not go to waste now. I have used it topically to remove suspect moles and they disappear in a few weeks. Word of advice though, I used it undiluted and it can irritate the skin around the mole or growth so try to keep it as contained as possible. I usually apply it carefully using a q-tip! Is botulism not a risk here? I thought it was any time a wet thing (eg fresh leaves) was infused in oil. I may very well be off base though…certainly not an expert on these things! Thank you for the great tip, I will def. try it out. I was just wondering how long it will keep if I store it in the fridge? This is one of the most helpful blog posts I’ve seen in a long time! 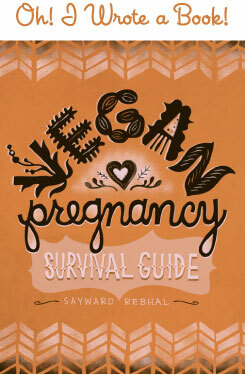 Thanks so much for the tutorial, Sayward! THANK YOU! Oh man, my partner and I are both under the weather and I’ve been judiciously administering what’s left of our oil of oregano, all the while thinking, “how the hell am I going to afford enough of this stuff to get us through cold & flu season?!”. I hope you’ve had a lovely week and that you’re settling back into year two of grad school. (As a tangential question, is your MSc thesis- or project-based? Either way, I’m sending you tons of productive energy). THANK YOU, thank you, thank you, thank you. 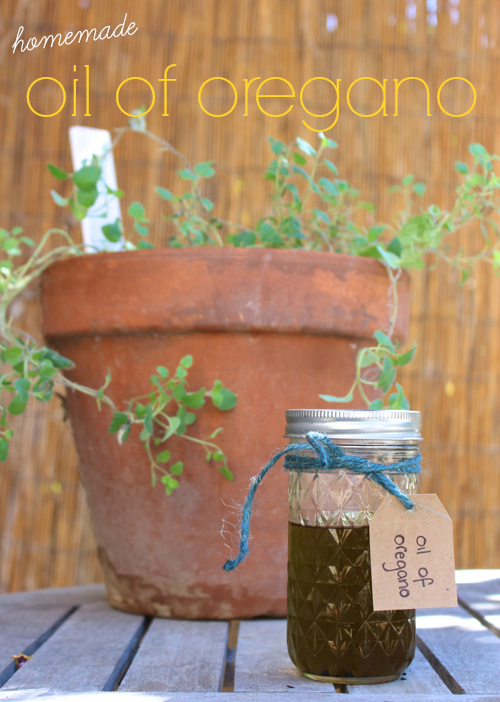 I purchased oil of oregano a year ago and when the bottle ran out I was devastated. I can’t afford another $27 6oz bottle so started saving my coins. We use it everyday hub, son and myself. I am so so happy to know I can make this on my own, greatly appreciated. Hi Jessie, thanks os much for your comment. I hadn’t seen botulism mentioned when I was researching this project, but after digging around a bit more (due to your comment!) I see that it is, in fact, a potential risk. I updated the post to include some words of caution. Thank you for bringing this to my attention! This might be my paranoia acting up, but please humor me! I started my infusion last weekend and today I noticed the tip of one leaf was poking out of the oil and starting to get a bit fuzzy. I scooped it out and topped up the oil so everything is covered. Can I keep this or am I going to die a horrible painful death? Thanks! This is a tough one. If it were fermenting I’d say bah, no biggie. But worth oils and the very real risk of botulism or other dangerous contaminants, I think I’d scrap it and start over. Hope that helps! I’m so excited to try this! My kitchen is severely lacking in supplies…I will be going to the store later this week to buy a muddler! Winter is coming early this year in Alaska…most of our leaves are already yellow. Thank you so much! I love boiling my tampon with some tahini! Sooooo delish. Hi Sayward, I realized that I never thanked you. I’ve used this recipe countless times since my initial post and so far no horrible painful death, only feeling amazing and nearly invincible! I’m actually making another batch right now. Keep up the good work here! 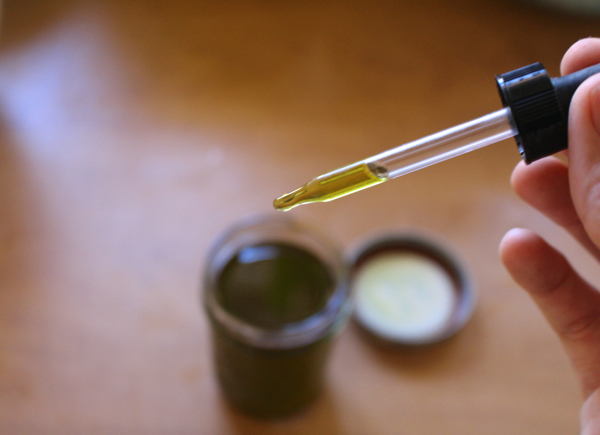 Oil of oregano and infused oregano oil aren’t the same thing. Note there are different species of oregano and not all contain the same beneficial compounds. I am thinking that if one brings the oil up to enough high heat to diffuse the moisture out of the leaves when added, that it will make the batch more healthy and fear of botulism can eliminated. I have the traditional oregano plant and one that has larger light green and sometime pink which I believe is more like the Cuban oregano strain. It has a good, strong fragrance. Can this type be used to make the oil? I tried doing this and was wondering what the final infused oil should smell like? I am new to all the herbs and essential oils and would love to learn more about them. Can oregano essential oil be used (diluted) as oregano oil? I made a batch of half a mason jar. Though I forgot to muddle it but left it in the hot water bath for 10 minutes and then left it by a sunny window for two weeks! This is as per the recipe I read before reading your’s! Hope mine turns out well.